2017 was a blast as always, with much sewing, collaborating, socializing, and general merriment. 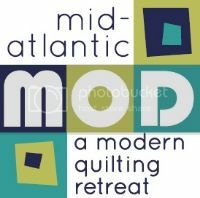 This is a quick update to let you know that there will NOT be a 2018 mid-atlantic MOD retreat. We know there will be many quilters disappointed upon hearing this news, but sadly, it's just not gonna happen. However, we do intend to come back again in April 2019 and we'll keep you posted as soon as we know dates. If you have interest in helping with the organizing of the retreat, please contact us and let us know. Thanks for your support these last 4 years and we hope to see you in Lancaster again! I always look forward to going out. A good tip would be to look out for those places with interesting concepts. This place is pretty amazing. I came up here with a friend. The San Francisco venues were spacious and food was great.